Ease the headaches and frustrations you face each week when you build your employee schedule with this intelligent, full-service application. Restaurants and retail stores were the focus when Schedappy was built. But any company with 10 or more employees can benefit from this simple system. 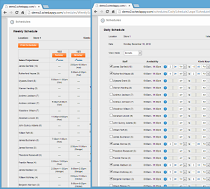 Schedappy provides exactly what’s needed for your scheduling needs - no more, no less. Start your relationship with Schedappy by taking advantage of a FREE 30 DAY TRIAL! Once your trial is over, pricing is just $30 per month for each location you’re scheduling. There are NO LONG TERM CONTRACTS and you can cancel at any time. You and your staff can access Schedappy from any computer with internet access. Schedappy also works great on tablets like the iPad and Surface, as well as on iPhones and other smart phones! There is no software to install and no special hardware required. In fact, the application is so simple to navigate that you can get set up and begin scheduling in just 10 minutes. Schedappy will impress you right from the beginning and you’ll soon be wondering how you ever functioned without it. 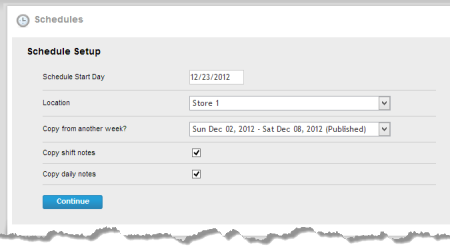 Schedappy is built from the ground up to be the easiest to use employee scheduling tool available. You can create and edit shifts in a weekly or daily format, get each week's schedule started quickly by copying the prior week forward, and use built-in daily views to quickly look for gaps in coverage. 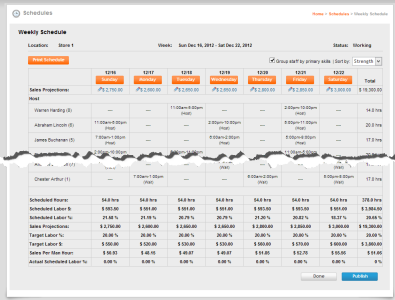 Schedappy has built-in tools that will help you control your labor costs. After all, it's better to schedule to your target labor percentage than to over-schedule and resort to sending your staff home from their shifts early. Schedappy has many features that will help you improve communication with your team. 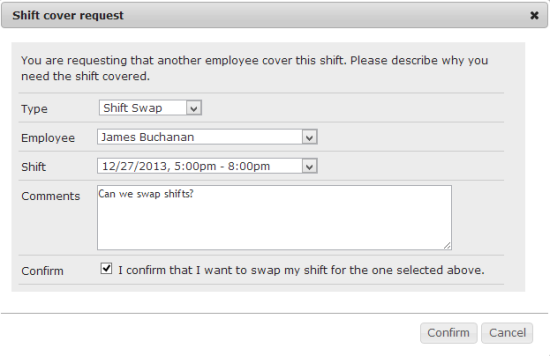 We keep scheduling constraints in the system instead of in a binder, let you post news to an electronic bulletin board, and we deliver shift information to staff via email and/or SMS text messages. 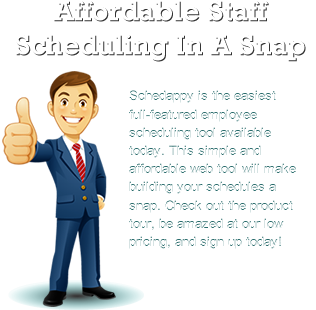 Schedappy will enable your staff to handle many scheduling responsibilities themselves. 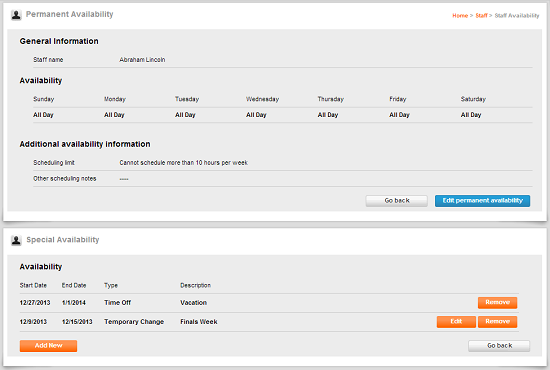 Staff can submit time off requests and availability changes online, they can arrange shift coverage or swap shifts, and you can even let your assistant(s) build and publish schedules without your involvement. Availability changes and time off requests are stored online instead of hastily written on paper napkins or scraps of paper! 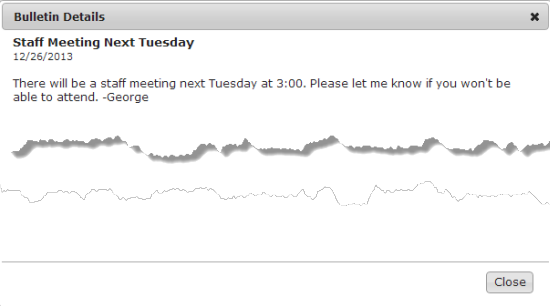 Published shift information can be delivered via email and/or SMS text messages. Schedappy is a lifesaver. 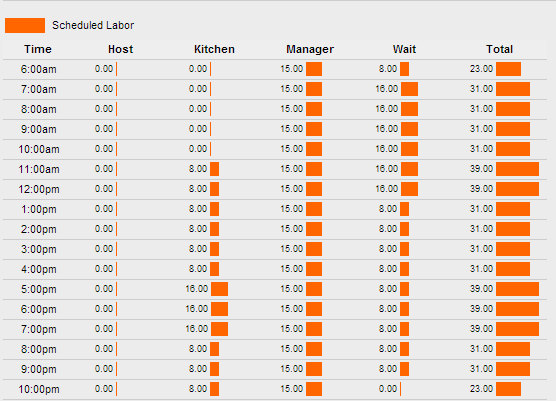 I've saved thousands of dollars in management labor because of how much easier it is to build a schedule. It has cut the schedule creation time in half and has helped tremendously with accuracy. We're in the middle of site re-construction. More customer quotes are coming soon! What does the name "Schedappy" mean? 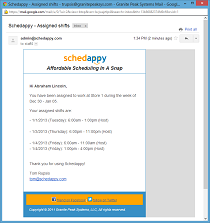 Think of Schedappy (\sked-appy\) as a combination of "schedule" and "snappy", or "schedule" and "happy". 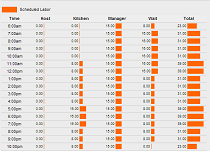 Building schedules can be frustrating and time consuming for managers. 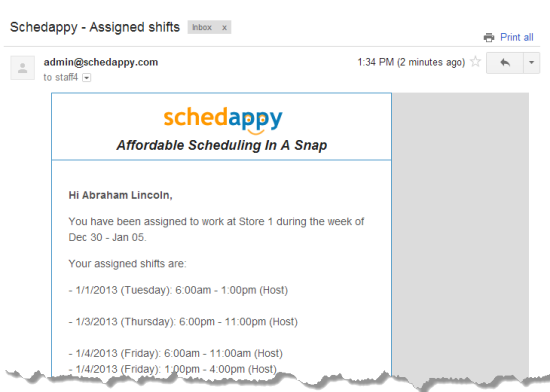 I think you’ll be happy when you see how Schedappy makes building your schedules a snap. Is this just for restaurants? No. Schedappy can be used by any organization that needs to schedule employees, like retail stores, medical offices, call centers and more. Our current client list includes a minor league baseball team, a firefighter training school, and a retail store. Although some options may work especially well for restaurants, you don't have to use anything that doesn't fit your needs. How come Schedappy doesn't do "XYZ"? 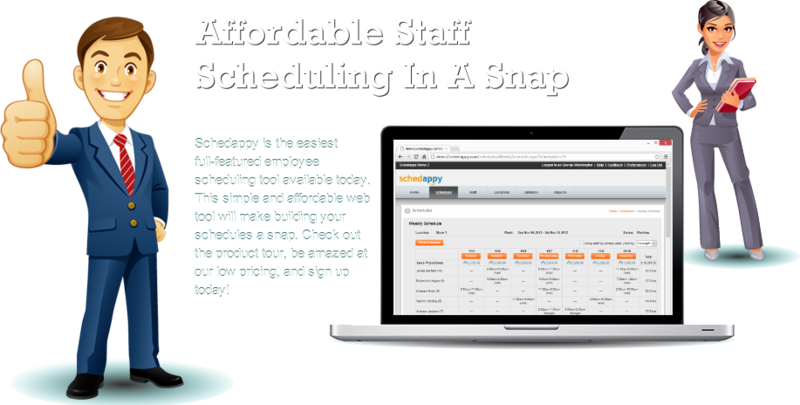 Schedappy was built to provide managers with the core elements of building a schedule in the easiest way possible – at an affordable price. New features are added all the time, and I would love to hear your ideas on how the tool could work better for you. Just send me a note at [email protected] with your ideas. I am located in Billings, Montana. You can send an email to [email protected] or call 406.672.8292 any time you have a question, need help, or want to share your feedback. Additionally, you can connect with us on Facebook and Twitter. Why is Schedappy so inexpensive? 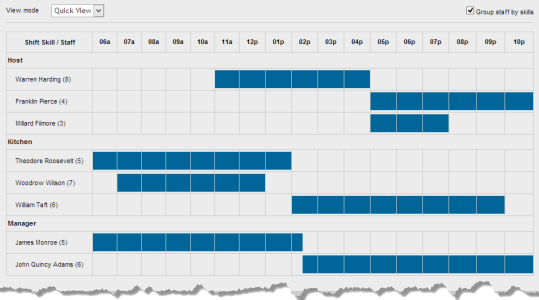 I solved a staff scheduling problem for a client and then made that solution available to anyone who wants to use it. I keep my costs low and pass those savings on to you. I'm not promising it will bring world peace; I just want you to have a nice easy way to build schedules and not have to pay much to do it. 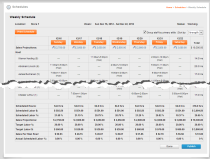 How is Schedappy different from other staff scheduling software? Additionally, I proudly provide ongoing personal support. I commit the time and energy to help Schedappy customers get the system configured to their specific needs, power through any initial learning curve and get their staff involved in the scheduling process. Because the application is so easy to use, follow up help is rarely required, although it is always available. Please complete the following fields to setup your Schedappy account. When you click the “Start Trial” button, you’ll receive an email with your account information. Remember, your first 30 days are free! 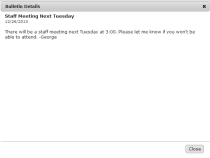 If your company already uses Schedappy then you just need to have your manager put your email address in the system. Then you'll get an email with instructions on how to login. Your account has been created and your account login information has been emailed to you. 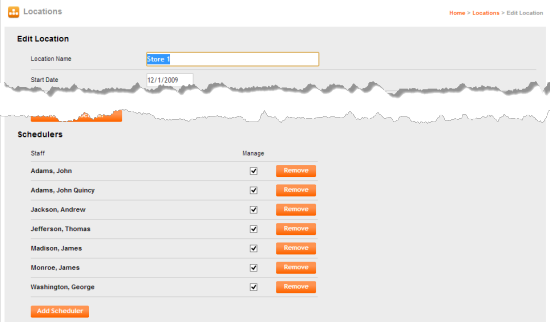 Please note that Schedappy's web servers use a process that is designed to reduce spam. Email delivery may be delayed by several minutes.